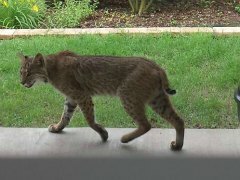 Wildlife in My Neighborhood - Is it Dangerous? Should I call Animal Control? Finding a coyote or bobcat strolling through your backyard or climbing your fence may be unnerving to some, especially if you come upon it unexpectedly. 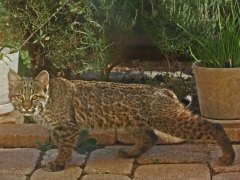 Many neighbors have written with concerns after spotting a bobcat or coyote in their backyards in the suburban housing developments of Allen, Frisco, McKinney and Plano. 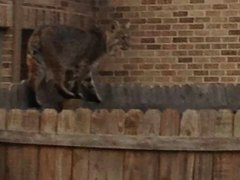 As the photo below taken at dusk in an Allen neighborhood shows, bobcats and other animals have no difficulty scaling six- to eight-foot fences to find their dinner in your back yard! Homeowners beware: small family pets are not safe in a fenced-in backyard. A bobcat or coyote cannot tell the difference between your small dog and a rabbit. One homeowner shared that a pack of coyotes scrambled under her fence and attacked her small dog while her large dog fought valiantly to save it--and lost. 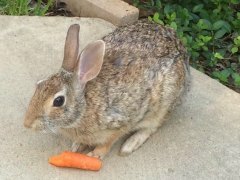 Follow this link from the City of Allen to learn more about the types of animals for which you should call animal control. We turned to the experts at the Heard Natural Science Museum & Wildlife Sanctuary in McKinney for their advice on the wildlife found in Collin County. For many of us, living in an area with plentiful green space is very desirable. Often, though, we find that we are sharing our green space with the wild animals that lived here before we all moved in. We did, after all, build our homes right on top of theirs. Most of the wild mammals that are encountered in backyards and neighborhoods are opportunistic omnivores; they'll eat just about anything in order to survive. These animal populations include coyote, fox, raccoon, skunk, opossum, bobcat and a whole lot of rodent species (many of the problematic rodent species are not native to the United States). All of these creatures are just trying to meet their basic needs--food, water, shelter and space to reproduce--in an ever-changing landscape. Most of them have learned to adapt to us. On the other hand, it seems we're having a bit of trouble adapting to them. If you encounter a wild animal in your neighborhood, stay calm. Coyotes, foxes, raccoons and bobcats live all over North America and usually avoid humans. There are very few documented reports of coyotes and bobcats attacking humans. Coyote or bobcat attacks are usually the result of misguided people feeding these animals, which may cause wild animals to lose their instinctual fear of humans. The Centers for Disease Control, state health department and our parks and wildlife department do not consider coyotes or bobcats a threat to humans. You are much more likely to be injured by a pet. If you encounter a wild animal such as a raccoon, fox or skunk, do not try to make friends with it. As cute as they may be, these animals are rabies vector species, meaning they are more likely than other animal species to carry the rabies virus. Most of these animals are not a danger but because some may be carrying the rabies virus, it is very important to keep your distance. Report any wild animals behaving erratically to animal control right away. If you see a nocturnal animal species, like a raccoon or skunk, stumbling around during the day, this is cause for concern. Keep all pets current on their vaccinations to prevent them from catching and transmitting disease. Mountain lion reports have been coming in more frequently. Though North Texas was part of their historical range, no DNA evidence, such as hair or feces, has been collected to support mountain lions being in the area now. Many people believe that bobcats are consistently heavily spotted and always sport a short bobbed tail. Many bobcats do but, some don't. There are bobcats that present with very little spotting while others have longer tails. In other words, the animals in the reports are most likely bobcats. If you see a large cat in your neighborhood, get pictures but only if you can do so safely. Keeping unwanted wildlife out of an area takes a collective effort. If your neighbors aren't in compliance, you'll still see wild animals in the neighborhood. Trapping, relocating and euthanizing wildlife does not solve the problem. If the habitat is not modified, made very uninviting, more wild animals will just move in or will increase their birth rate to fill the gaps. When humans move out of their homes the expectation is that someone else will move in; the same thing happens with wild animals. If pets must be fed outside, remove food and water containers when your pet is finished using them. Clean up all spilled pet food. Never leave food or water bowls outside overnight. Don't feed the birds. If you do feed them, clean up fallen seed each evening so rodents, a primary food source for bobcats and coyotes, do not use your yard as their local diner. Remove any hiding areas like spaces under a deck, storage building or garage. Seal cracks and gaps in and around your home. Keep a very tidy yard. Remove brush piles and if you have fruit-bearing trees, clean up fallen fruit with vigilance. Trim shrubbery so there are no hiding places for wild animals. Do not take garbage out until the morning of the day it is to be picked up. Do not leave pets outside unattended. Pets, like small dogs and cats, will attract predators to your yard or neighborhood. Do not intentionally feed any wild animals. Doing so puts you, your neighbors, your pets and the wild animals in jeopardy. If you do encounter a wild animal do something to scare it. You could yell, wave your arms (never mind what the neighbors think), jump up and down or throw something near the animal like a tennis or soccer ball (watch the windows, though). You could also spray the animal with a quick, hard blast of water from the garden hose. It's much better for wild animals to be afraid of humans so be very scary and make some noise! North Texas is fortunate to have many wonderful species of snake. Most of these animals are non-venomous. The most common non-venomous snake is the Texas rat snake while the most common venomous snake is the copperhead. Immature Texas rat snakes are often confused with copperheads. Take a look at the Texas Parks and Wildlife web site for photos of these animals. 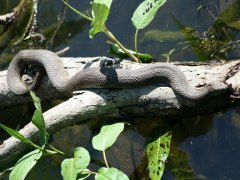 You may encounter Cottonmouth/Water moccasin, another venomous snake, in our area. But most of the aquatic snakes around the area are harmless water snakes such as the Blotched or Yellow-bellied. These two species look very much like the Cottonmouth if you don't know what you're looking for. Like other native animals, snakes are just trying to "make a living." With the expanding North Texas human population, the rodent population has likewise exploded; rodents love to live in very close proximity to humans. The snakes are staying here in the area because, thanks to us, there's a never-ending supply of rodents to eat. If you observe venomous snakes your neighborhood, take precautions. Follow the previous instructions to eliminate prey species from your yard. Start to adopt some new habits for yard work. For example, before reaching into bushes, large planters, wood or rock piles take a minute to scope things out. Poke around with a stick and rustle the leaves and debris a bit. Teach your children about venomous snakes by showing them photos of these animals. And, those little green snakes we see around North Texas are nothing to fear. They're harmless Rough green snakes not venomous vipers. Like other snakes, they really don't want to be hanging out with humans so just let them go on their way. Bird watching has become an American pastime favorite and birds are worth watching! Still, we receive a lot of calls about nuisance birds. The most important thing to know about dealing with birds is they are protected by federal law. The only species not protected are non-native European starlings, European house sparrows and feral Rock pigeons (like those you see under bridges). Harassing or injuring native bird species is against the law. Once a bird has laid eggs in a nest, it must be left alone. 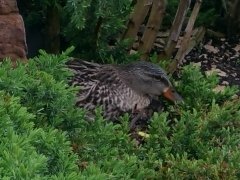 Homeowners with swimming pools or elaborate ponds in the yard often find themselves with baby ducks hitting the pool come summer time. The solution to this problem is to police your yard throughout the spring to make sure ducks aren't building nests in the shrubbery. If no eggs are found in a nest, the nest can be removed without breaking the law. While it's true that a large bird of prey may consider your small dog or cat as potential food, if you are outdoors with your small pet, chances are the bird will just move on. If it doesn't, just wave your arms and shout. Wild animals are essential components in maintaining balance in nature and education is the key to peaceful co-existence with our wild neighbors. Educate yourselves, and your neighbors, and check out reliable web sites for more detailed information about our incredible native animal species. It came to our attention after publication of the above article that this little mammal was not covered in the article provided by the Heard Natural Science Museum & Wildlife Sanctuary. So we turned to the experts at Texas Parks & Wildlife for information. Probably due to its strange appearance, the armadillo has created a buzz of interest, resulting in sales of--shall we say--rather unique souvenirs. That said, they are prevalent in Collin County and may be the cause of the cone-shaped pits about 3-4" deep you find in your yard. The good news is that the armadillo is dining on the same grubs that will ruin your landscaping, in addition to ant hills and termites. 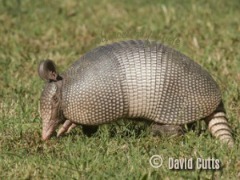 Be aware that armadillos can carry leprosy, the only mammal other than humans that do so. While thorough cooking of armadillo meat should make the meat noninfectious, risk of infection (if any) still remains while handling the animal. Apparently armadillo meat isn't terribly enticing due to the strong odor when butchering one.